An art exhibition which prompted the resignation of the president of the Royal West of England Academy in Bristol has opened. Simon Quadrat quit this month in protest at the way he said the artistic direction of the academy was going. 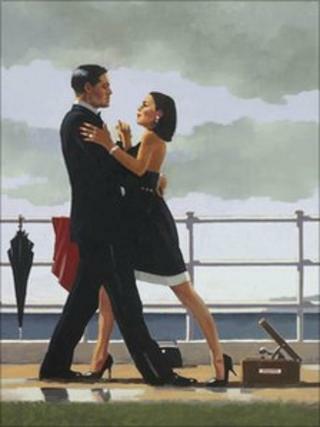 The exhibition by Jack Vettriano includes one of his most famous paintings - The Singing Butler. Staff at the gallery said the exhibition was part of a move aimed at attracting wider audiences. The Scottish artist, whose work was once shunned by the National Galleries of Scotland, has previously been forced to defend his use of illustrator's guides to produce some of his works. One of his paintings will go on display at one of those galleries for the first time this autumn. Mr Vettriano, who began painting after receiving a set of water colours for his 21st birthday, said of his work: "The whole debate between the public loving it and critics hating it made it controversial and I've benefited from that. "I don't mind it at all I've always wanted to be a bit of a maverick." When he announced his resignation, Mr Quadrat said it would be "foolish" to believe the only way of bringing visitors in was to put populist art on. But academy director Trystan Hawkins said someone could come to see a popular artist's work and then look at other exhibits. He said Mr Quadrat's departure was more to do with a lack of consultation over the type of exhibitions being shown rather than Mr Vettriano's exhibition itself. "My job is to get more people into the building," he said. "I talked to Joe Public on the street about what they'd like to see and Jack was top of the list." The RWA is one of five Royal Academies of Art in the UK.